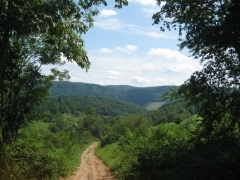 This 16.62 acre tract is located on a private gravel road that will require four wheel drive for access. The tract is wooded with many large hardwoods. The terrain has several ridges and valleys that make it perfect for setting up hunting stands that overlook large areas. A driveway that leads to the middle of the property was roughed in several years ago saving several thousand dollars in dozer work. The old driveway will need clearing and improvements to be usable by anything other than a four-wheeler or modified Jeep/Truck. This tract would be great for horses, ATV's and dirtbikes. Wildlife is abundant in this area especially deer and turkey and hunting is allowed. Power is at the tract, well and septic will be needed for water and sewer. The only restrictions on the property are pretty minimal... There can only be one home per 2.5 acres, no salvage yards, no commercial pig/chicken farms (animals to support your family are ok), etc.